There were a ton of upsets on Friday. The latest major Call of Duty World League LAN event for WWII is underway, and fans have already been treated to several high-octane matches. The 2018 CWL Birmingham Open kicked off earlier today, as the best Call of Duty teams in the world traveled across the pond to fight for their share in a $200,000 prize pool. 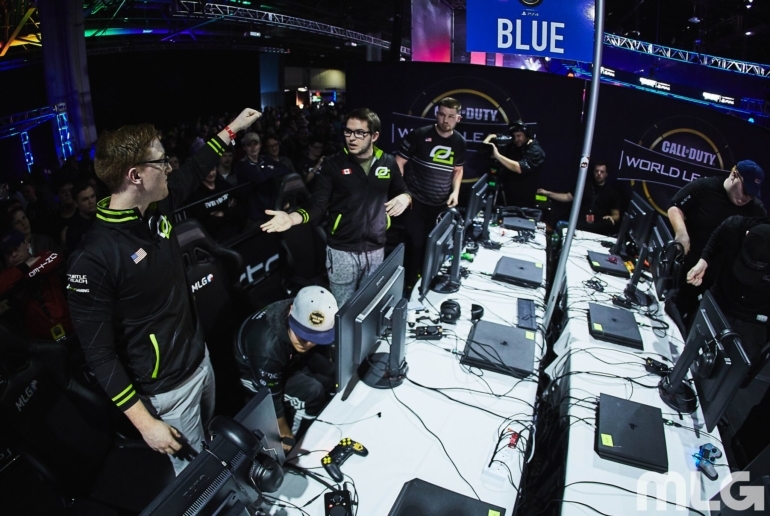 CWL Pro League teams each played three matches in the group stage on Friday, and only two squads remain undefeated in pool play at the end of an upset-filled day. OpTic Gaming got off to a strong start in Birmingham, defeating Evil Geniuses, Team Envy, and Reckless to go 3-0 on Friday. Splyce also really turned some heads in Pool D as they took down top squads like Luminosity and Red Reserve to start this weekend undefeated. In Pool A, eUnited pulled off a shocking upset as they swept Rise Nation. This marks Rise’s first series loss on LAN since Jan. 25. And despite using Jared “Nagafen” Harrell as a fill-in, Echo Fox are 2-1 alongside eUnited and Rise Nation in Pool A. Pool B also featured a merry-go-round of losses. UNILAD took down Team Kaliber 3-2, but fell 3-2 against Team Vitality. Team Kaliber bounced back to beat FaZe Clan 3-2, however, as the two-time WWII champions now sit atop their group. Here are the current pool play standings at the 2018 CWL Birmingham Open (each team’s series record is followed by their map count in parentheses). CWL Birmingham will be back in action on Saturday, March 31 at 9am ET.